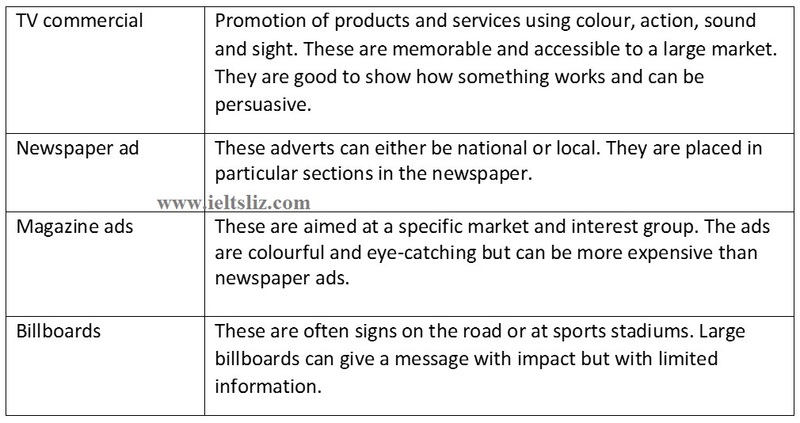 This lesson focuses on essential advertising vocabulary. There is also an audio so you can listen to how the words are pronounced. At the bottom of the page, is some practice exercises to learn how to use these words correctly. 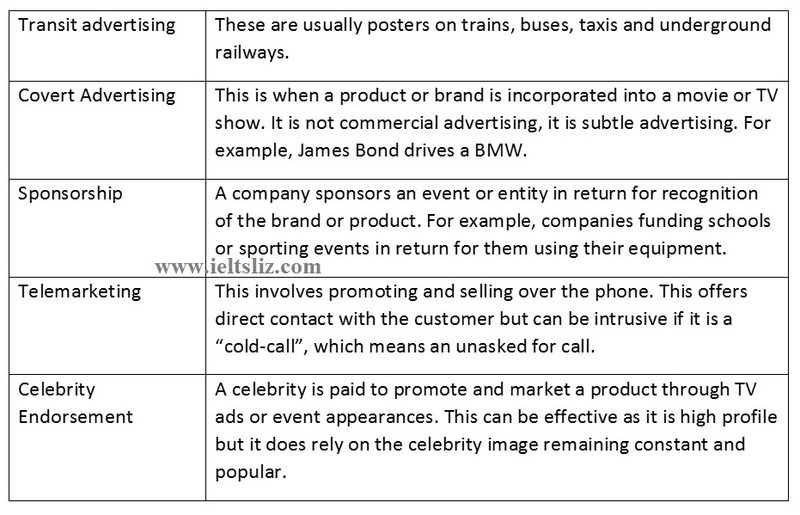 Advertising is a common topic in both IELTS speaking and writing task 2, so you must learn all the basic vocabulary to be able to talk and write on this topic. This lesson contains a lot of vocabulary. Take your time to learn the words and practice your pronunciation. There is an audio under each table for pronunciation practice. Use the vocabulary above to complete the sentences. Words may be used more than once. I think I prefer …………….. because they are really good fun to watch and often have a catchy tune or song to go with them. Last night, I was just sitting down to my favourite series on TV when the phone rang. It was another …………. I find them really annoying. Personally, I think that …………………… in movies is the most effective because you aren’t even aware that you are being targeted by a company while you’re watching. I think ………………… are a great way to advertise because they are so entertaining but I guess they must be very costly to put on, particularly at peak viewing time. I hardly ever pay attention to adverts in the ………………….. because they aren’t usually very attractive but whenever I flick through a ……………., I’m constantly drawn towards their beautiful, glossy ads. I find telesales quite ……………….. because they call your home to sell you something. I think it’s an invasion of privacy. Dear Liz, I would like to express my most heartfeflt gratitude for all of your help and work you have done over the past years. It is the first time i am using your website. I can see that it is very useful. Thank you for that. I appreciate. Hope i will get my high score on IELTS. its a great plateform to improve ielts skills, and i would definitely recommend this website to my friends. Thank you so much for all support you are giving Liz. this is my first time here and really appreciate your hardworking , hope to approach my ilets target soon with you , thank you very much Liz . As far as I know, and as it’s mentioned on your website, in Speaking part I can use any accent (British or American). Is it considered as a mistake if most of my speaking will be with an American accent but some of the words will be accidentally pronounced with a British accent or if I’ll use British equivalent of an American word? For speaking, it’s fine to have a mixed accent. For writing, you must choose either US spelling or UK spelling. You can’t mix them. This is the first time using your website and i feel so great to using it its very useful for me to improving my band score…. Glad it’s useful. Read the instructions on the HOME page to learn how to use this site for your IELTS preparation. Would it have been correct if I answered “telemarketer” instead of “cold call” at number 2? It seems to be grammatically correct and the person making the call is called a telemarketer (derived from the category/type of Advertising the point refers too). I work in advertising and in my country (South Africa), we mostly refer to those phone calls as another “telemarketer call”. Or should we rather strictly follow the text as given? I though it might be a “trick” question. A “cold call” is NOT a person. A cold call is an action where someone calls you randomly trying to sell you something on the phone. Your service towards humanity is ideal. You are the best ILETS tutor. Thank you for providing such detailed information. It was really helpful and I did learn a lot. Although I see a factual error in the “Covert advertising” section. James Bond actually drives an Aston Martin not a BMW. I would really appreciate if you will be able to correct it. My wife has a medical condition due to a stroke , she had around 6 years back. She is still unable to speak fluently and takes more than the usual time to understand and respond. Is there any exemption or help is available for her in IELTS exam, particularly in Listening and Speaking tests? You will need to ask IELTS directly about this. I’m sure that something can be organised to facilitate your wife with a medical certificate. But you will need to speak directly with IELTS. There are various patterns for disabled or people with special needs in the IELTS module so you have to find it via IELTS website or by contacting any center for further information. I always adore you as you help plethora of people like me,god bless you. God gives you 101 years of life very happily😀😀😀😀. Madam your work is very brilliant and very supportive to all the ielts students and for me too. THANKS A LOT . I find your lessons very useful . Can I get feedback from you for my writing task 2 essay because I am finding it difficult to evaluate it myself. Sorry I don’t offer that service. I am so happy that I found really good teacher in my life , Your pedagogy is too good. May you live long and keep delivering lecture . Thank you very much. Would you please guide me to find a reliable common phrasal verbs resource? dear teacher.. i felt like i am sitting in front of a dedicated teacher who wants to make sure her students are getting the best result from her .. nicely done.. really easy to go through all the 4 modules ..
Firstly I am sorry Liz. I want to take ielts 8.0 or 9.0 score but I don’t have ielts moduls. do you help me and give me reading,writing,speaking,listening and vacabulary moduls from 0 to 9 score?? There are 300 pages of free tips, exercises and model answers on this website – start reviewing the pages. Click on the test section on the red bar at the top of the website. I have to much difficulty in reading section please guide me regarding reading. Hi Liz. I have one qustion. Which task i should start with first in writing section??? You can start with any task you want. I recommend you practise both ways and then decide which one you prefer to use in your test. wow! really outstanding! I really improve my self frim your site. Thank you very much. Can I write my all listening and reading answers in capital letters? Moreover, can I write s in bracket if I am not sure about answer with purals or singular? You can write all your answers in capital letters for listening and reading – I recommend it. You NEVER use brackets for your answers. Your are being tested in the ability to listen for plurals. Hi, I’m Mohamed Ibrahim, thank you for your usual help and support, may I have a link for all your IELTS videos? Hi ..! i am really thankful and hope you will be keep on sharing the same. My name is Miraziz I am from Uzbekistan I study English I want to take IELTS certificate but my English level Intermediate my teachers sai: you should prepare firstly Pre IELTS course so I woul like to prepare sef-study. What books should I use for Pre IELTS? Could you give advice me please? I want to thank you in advance! I don’t know what a writing checker is. I’ve tried a number of online sites which offer writing that can automatically be checked for accuracy – noe of them are very good. The majority of mistakes are missed. I just want to ask about writing tast 1, I read recent ielts exam mostly there are bar charts questions so I have to do only bar charts or all you have mentioned in your website. Sorry Ms Liz. I can not download or print the exercies from your site!! Most of my materials are to be used online. I am preparing for my IELTS exam which will be taken on the 25th of march. I am not really a fan of essay writing. i do not know how to start, what to write in the body and how to conclude, Also i have problem with reading fast and understanding the passage. Will appreciate it if you help me out. Sorry, most of my lessons are for use online only. I want to know is there any syllabus for speaking test or is there any particular number of speaking cue cards that we can consider for exam? Or examiner can ask anything? See this page for last minute tips (Speaking tips are at the bottom of the page): http://ieltsliz.com/ielts-exam-tips-on-the-day/ Good luck! I am bit confused regarding coping my answers on answer sheet. My tutor asked me to write all the answers in capital letters to avoid any mistakes. My exam is on 21st January and I need some last moment tips and do tell me what can I do more in these 2 days. Many students choose to write all their answers in capital letters for listening and reading. It’s fine to do that. Here are some last minute tips for each part of the test: http://ieltsliz.com/ielts-exam-tips-on-the-day/. Also read this page to make sure you understand all aspects of the test: http://ieltsliz.com/ielts-exam-tips-on-the-day/. The main pages of this website are accessed through the red bar at the top of the website – check them out! Your blog has helped me to prepare adequately. Is it mandatory to show examiner the usage of all tenses during speaking test ? I am need to score 7 bands, fyi. You should show a range – it isn’t always possible to use all tenses that exist in English. Aim to give a past tense, a future form and a second conditional as minimum. What is a second conditional ? Please tell something more about it. If I had time, I would …. / If I was independent, I would …. This structure is second conditional. You need to contact your local test center and ask them. I had taken the IELTS Academic exam on the 10th of December, I got a 6.5 for Speaking (I need a 7). I always do so well when I was practicing, but when it comes to the real exam, I’ll be so nervous until I’m thought block. I am so sad and disappointed because this is my 4th time taking the exam. What can I do to overcome this situation? This website is for IELTS skills rather than improving your English. To improve your IELTS speaking skills, see this page: http://ieltsliz.com/ielts-speaking-free-lessons-essential-tips/. I hope to have another website for English language development in the future – if students will find it useful. Hi Liz. i really need help regarding my ielts exam. can i ask you some question please? Thanks Liz so much, you’re the best teacher!!! I am really loved your lessons , videos , tips . WORDS cannot be ENOUGH to tell or express my feeling… . Thank you so much for helping us the way YOU do. AND I have a problem is that HOW can I practice the speaking part? because i do NOT have a PARTNER to practice with him or her. I love your teaching program; I have learnt a lot from your website and videos. Thank so much for your lessons. I do not have tests, I have practice exercises to develop skills. Therefore, try one full practice test from the Cambridge book and then do some exercises to improve. I would like to know if I use the same sentences you have written here at my ielts exam, is it ok with the examiner or not? will I lose score by using exact sentences from books or websites like yours? hi.i found ur videos on telegram and these were very usefull for me.now regularly follow ur tips and teaches.thank u. How to check my English level to get IELTS band score 6?? I am so thankful for all your tips and samples they all are very helpful to uplift my English level. but the only problem I am stuck in speaking. Provide me some tips to get nice band score in this test. See my main speaking page: http://ieltsliz.com/ielts-speaking-free-lessons-essential-tips/. You can find all main pages through the red bar at the top of the site. Amina Anwar , incidentally I open this site due to vocabulary but it not a website its a city of knowledge for the students. I also started IELTS and I have difficulty in vocabulary but now I have not any problem regarding vocabulary . i just wanted to copy and paste all your materials but they are copyright protected. why it is so? you are giving the best but yet wants to make limited access on it…why mam? The copy protection is to protect my work. Some pages are downloadable and some are not. But at least 300 pages are all free. Your listening materials are very catchy and educative…really beneficial to the whole student community. Thanks to ur blog. Thank you for this website mam. I love it and I enjoyed it mam. I need help in writing task 2 general module. I require band 8 in writing. I have attempted twice and both the time my score was 7. Can you please advice on how to go proceed to improve my scores. Liz is one of the best who know how to transfer knowledge from one to another. best regards. I seen some of your you tube video’s all are very helpfull i do practice more but im not getting appropriate score once i give exam from general and i got the score overall 5, now i planning to go for acamedic and required score is overall 7 each. please advice me how i can get score and how i do practice , how many hours i should spent for study. just need your help. To get band 7, you will need a higher level of English. Tips help with the test but if your level of English is too low, you will not get band 7. Work on your English before aiming for band 7.
hello mam, im naaz,, how should i start my preaeration for ielts general writing.. im poor at writing, not underestanding, how to start and wer to start, plz guide me..
Hi Liz I hope you be healthy. I want to take an ielts test, but my writing is not good. So, I need someone to check my essays and correct my mistakes. Would you check my essays if I send by email? If you can, please write your email. Very Good Teacher. May you live long!!!!!! I am fathima applying for phd psychology at uk and i need to score individually band score 7 and overall 7.5.could you please send me a good tips for scoring this mark and do u have any ielts book (pdf).please send me to my email. How can i improve my English. i need band 7 all module.Thank You. I am weak at listening. How can I improve listening? you are unbelievably helpful to everyone who aspire to have a higher score in ielts test. i took the test for the 3rd time and i still cannot get a score of 7 in speaking. that is my only problem and i am already afraid of sittin again to retake my test. any advise? i have difficulty in composing my ideas. Haha I’ve been only studing the English for 1 year and got the 7 score in speaking even thought my vocabulary wasn’t so rich and precise(but I got less than 5.5 in the rest moduels thought).I would recomend you to watch more TV shows and try just reapit after them in the same time.And another fact tot speack fluently is to learn the banal worlds by heart and deeply so that you may use then in any world struckture that tears off from your mind. everyone can be a teacher to someone. if your tips were effective to you why can’t I try it, right? thanks anyway to your tips. noted, i will try it. Band 9! That’s fantastic!! Congratulations on a top result. All your hard work and determination was worth it. I wish you lots of luck in the future !! I need your help, i have more grammar mistake when i am writing task 1/2. Congratulations for scoring so well. Band 9 seems a lot of hard work. I would like some tips from you as i have less than a month for my IELTS and i need a band 8 or 7.5 for my admission and scholarship. would you like to help . ( In conclusion, i would say that social network media……) plz comment on” i would say”…. It’s informal and not recommended for essay writing. I think you are wonderful , I have written my IELTS two times with speaking 7, writing 6.5, Reading 5.5. It was a surprise to me because I was thinking that I will get band 7 on all but going through your teachings, I knew why I failed. I am going to write another IELTS on 12th December, hoping that I will do well as my aim is to get band 8 on the three. Here’s a link to how to improve your reading score: http://ieltsliz.com/ielts-reading-tips-how-can-i-improve-my-score/. For advanced writing task 2 lessons see my online lessons: http://subscriptions.viddler.com/IELTSLizStore. However, also consider spending time reviewing your English. To get band score 8, the majority of your sentences for speaking and writing need to be complex and error free. You are really number one among all IELTS videos in Youtube! Thank you so much and high appreciation to your support to all of us! Although, I’m going to take Toefl IBT exam, but I really like your job. It’s amazing even for IBT practice and I could find a lot of necessary information. My name is khusan.I watch all of your video lesson on the youtube or this website.it is very helpful for preparing IELTS.I started preparing IELTS a month ago and i need some advices about how to prepare IELTS.i hope you could help me to prepare IELTS.I don’t really know my level.but i have two month to prepare IELTS. i’d like to pass IELTS exam on december……I will wait a reply!! Please see my video with preparation tips on the home page. I think that your files and lessons are fantastic Liz. Thank you very much for all your efforts. I’m so thankful. First of all i would like to thank you for making such an awesome videos. last month i took my exam got a very good score. it wouldn’t have been possible without your support. Really from the bottom of my heart….THANK YOU. Mr. Mohammed it’s my pleasure to write to you. please, I’m planning to get my test in two months, but I’m kind of lost. could you help me please and give me some advice. Read all questions and answers on this page to start learning IELTS: http://ieltsliz.com/ielts-help-faq/. Then work through lessons and tips on the individual skills pages. I have been following your website and youtube lessons for quite some time I know and find them immensely helpful, so, a BIG THANKS for all your efforts! However, I am struggling and infact, I am quite afraid of the speaking test since this is my first attempt. I can’t find someone to talk to. I am recording my voice and checking my speech for errors that you have mentioned. Is there any other method by which I can improve my speaking and at least get a band score 7 in speaking? Last thing I would like to ask, which pronunciation will the IELTS Examiner judge me for, like US and U.K have different pronunciations for same words so which one of them should I practice? I will be appearing on the 8th of October and I am applying for U.S.A . Please see my video about how to improve your speaking at home. It’s on the main speaking page. IELTS is an international test so all accents are accepted. It is common for students to take the test more than once. The first time, they discover more about the pressures of the test, the format and also about their own weaknesses. After that, you should make a list of things you really need to improve – specific things. Once you are improved and more confident, book the test again. Don’t forget you can also buy individual writing task 2 lessons if you need more help from my writing course – there’s a link in the right hand side column. Today I have seen writing task 2, it’s really very good. Anyone can easily understand. Today i have found your blog and I’m so glad to see you here. I am sure i can get some important tips on how i can get my goal band on IELTS . Also, i read your followers comments its really help me a lots how to prepare myself before taking the exam hence I have similarities errors with them firstly reading ,secondly writing essay. Once again let me express my feelings how great full I am, really appreciated your efforts. I’ll continue visiting your site every now and then. I’m glad to know you find my site useful. You can learn a lot from both lessons and other people’s comments. hi liz….,i am weak in vocabulary and trying to improve my vocabulary so i am practising the vocabs which u have wrote on your website but i wanna asked u that do i need more to practise more such as to prefer more books for vocab or not?? ?,is your vocabulary is sufficient for our ielts exams? You should always prepare as much as you can. Get as many topic vocabulary books as possible. Just look around online to find one you like. hi mam, i am a poor in english so i did not reach my gole,i wrote three time ielts test two time academic and after 3 years i wrote general test w-5,s-4.5,r-5,l-5.everytime i score 5 bands.i need some help to you because this time i need overall 6 or 6.5 score in ielts test.so how can i improve my english could you please send me a good tips for scoring this marks and do u have any ielts book ,please send me to my email.i shell be thankfull to you. I find your writing tips and vocabulary lists really useful and want to print them out and carry them with me so I can go through them when time is available e.g. on the bus , waiting for someone etc. However, it seems printing ur materials is disallowed. I understand this is copyright protection, but it is rather impractical if I need to copy everything out by hand since it is not just a word or two but pages and pages and pages. Could I ask if there is a way to print them out for my own reference? The pages with lots of vocabulary usually have downloadable pdf files. Take a look. But not all of them because I haven’t had time to complete them. Hello ma’am, I have been seeking help from your lessons and i have found them very useful. You are easy to understand and you explain it well. I really like your lessons and i am thankful to you for guiding use with your valuable knowledge. I am feeling difficulty in accumulating new words. How can i increase vocabulary ? Start making a word list. To learn words, you need to use them. This means practice putting them into sentences when you answer questions, practice spelling them and practice using them in writing. Also start reading more. The more you see words in context, the more you will remember. Don’t forget that you should not aim to learn 20 words in one day but rather learn 5 words very very well. I’d really like to thank and grateful to you for the efforts you put down to help us. I am appearing for IELTS next month Oct24. I was googling about IELTS speaking tips and found your blog. It is nicely written and structured. But i would like to get help in speaking section because i always rush through whatever topics were given to me and complete in just 1-2min. It would be of great help if you give some tips to expand my speaking time. Firstly, there are NO questions in part 2. There are guidelines for the content of your talk. You should use your 1 min to think about what you will talk about and what extra information you will add. You can add information about people, past experience, future hopes, buildings, streets, activities, weather, food etc. You can add any information to your talk to make it more interesting and to show the examiner the range of your language. Ever time you speak is a chance to show your English. See my speaking page for more tips. Please see my home page to watch the IELTS Preparation video. Developing English is something you must plan for yourself. MY blog is about IELTS rather than English. Thank you for this great opportunity to learn with your lessons. I will be taking my academic ukvi exam on sept 26. I am bothered because its my first time to takr the exam..im struggling with speaking and reading…and sometimes i cant finish my reading aand writing in time..what should i do? Thank you in advance. You will find lots of tips about improving your score and techniques for answering questions on the main pages for each section on this blog. Thank you very much for your efforts.. i am so happy cuz i found like this website that has a lot of information. i have download\watch all of your videos which are updated on youtube. first of all i tell you big,very big thank you for your such a nice effort. i have already taken a date which is 24.oct and i am not confident about my IELTS band score. in the past i give IELTS exam and i got a 5.5 overall band score. it’s time i’m very nervous and day by day my nervousness was increased and i can’t even think about it. plzz tell me or guide me what should i do.. Spend some time planning how you will use your time to prepare before your test. Review each types of question for all skills. Review all model answers. Think about techniques. Also start writing a word list of paraphrases from the practice listening and reading lessons on this blog. Take your time. All my free lessons are contained on this blog. There is a lot of free tips and materials to help you. I am not able to help or tutor individual students. I appeared in the IELTS General from IDP in June, where I got 5.5 bands, now I booked again in October from British, Let me know how should I prepared to get 7.5 in each, Please reply fast as I am loosing my level of confidence day by day. You must review all information pages for each section, review band score information, review model answers and also techniques. Then you must review your English language. To get band 7, you should have few errors in vocabulary and grammar. Take your next test when your practice test scores are at the band score you require. Hi, I am glad to visit your site here. In fact, I was wandering to find an appropriate way to lead to a successful destination to IELTS. And I got you here. I’m dated on Sept.26.2015 but yet, I don’t have sufficient materials to have a better preparation. Actually, I realize that I am remarkably weak on vocabulary for writing tasks and speaking on the other hand. I would be obliged to get your hearings regarding the issue. You definitely need a good range of vocabulary and to understand collocations as well. There are books, “Vocabulary for IELTS” as well as some other books, which you can get. If your English is not good, you should wait until your level is better to do IELTS. If you want band score 6, you should have only some errors in English with enough language to talk about most topics. If you want band 7, you should make few errors and have a very good range of language for all topics. Huma here.i gave my ielts exam on july 2015 and got 6 bands at that time i was following your site also joined acadamy. although my requirement is 7 bands in academic,like time i decided to just follow you because regular classes are not useful in my opinion. kindly give me some suggestions i actually feel blank this time. and i must say you are Great………..Excellent job! The problem is your level of English. You have too many errors for band 7. Work on your English to build more accuracy before you book another test. Dear Mam, i am your great fan it is good to see that you are helping the Allah’s Creature without taking any pinny May Almighty Allah protect you and give you a long life. Mam i want to share you some personal information please how it’s possible? Liz, you are amazing. I have never experienced a great and a sincer teacher like you. Publishing and sharing your knowledge without any cupidity is marvellous becuase this is effectively going to help all of us to get higher band score. I am struggling with the words to admire your efforts and contribution that is the very focused and to the point for IELTS. You are great and world would hardly find people like you who are really dedicated and stunning. Wish you all the best. I am manoj giri from Nepal. I would like to know little about, is grammar important, if yes what actually in grammar do i need to learn. Can you kindly suggest me please..
Grammar is 25% of your marks for speaking and writing and plays a role in listening and reading. You just need to learn tenses, sentence structures, articles, plurals etc. Visit a grammar website and start learning. You’ll find a link to one in the IELTS Extra Section on the Useful Website Page. Thanks a lot for your kind information. I will start learning grammar right from now.. Thank you liz for all efforts. In exercise sentence no. 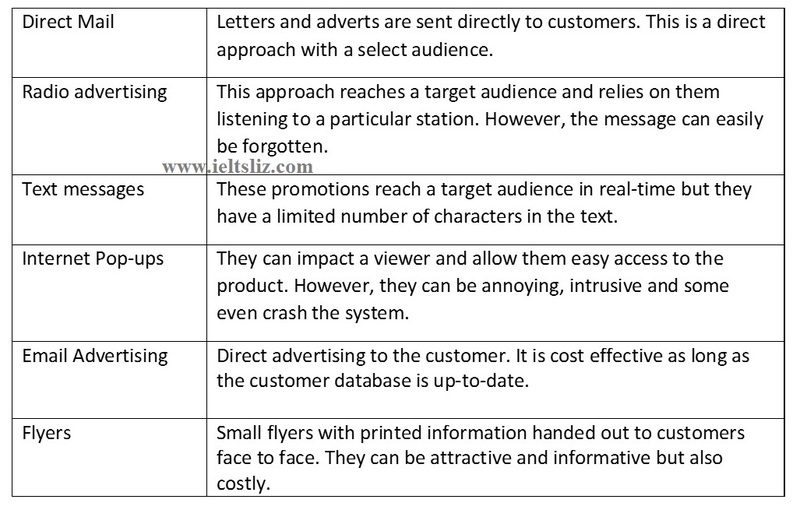 3, does the answer ‘covert advertisements’ match with ‘is the most effective’ gramatically? Sorry, it was a typo. I’ve altered it. Since last week I am going through all your lessons. Very useful! the way you explain is so amazing! I feel that you are just teaching in front of me. I have learnt many points, too easy. Great! Thanks a lot Liz. I learnt a lot from your site. I like your videos much. You present lessons in an attractive manner. I specially appreciate the effort you make on the vocabulary part. Thanks once again!! Most students can’t finish on time for two reasons: 1. they make lots of mistakes while they write and spend time fixing them 2. they change their ideas and need to think of ideas and get stuck. For both reasons, the solution is planning. If you have each paragraph and all supporting points, the writing will come easier and faster. Also practice is necessary. Your videos are really helpful. where is the videos?on youtube or on this website? Videos are ob both this blog and my youtube channel. Please see the relevant section to find the videos (speaking, writing etc). Just I watch your some videos about IELTS listening section. I am very happy to say that your videos very very helpful for IELTS tips and tricks. But I’ve a problem that I ‘ve no partner to practice . please give instruction how can I improve my skills. You don’t need a partner to develop listening skills. If you are talking about speaking, then please see my speaking page and you will find a video lesson about improving your speaking at home. Thank you very much, Liz! I love your lessons. I’m sharing them with my friends, too. A big thank you to you Liz. I am preparing for ielts examination in next 3 months. It is very useful website. Thanks again. Work carefully through all my lessons and tips on writing task 1: http://ieltsliz.com/ielts-writing-task-1-lessons-and-tips/. You need to learn about the content and how to present information. something hard to believe, I dont know how to thank you. I gain nothing except satisfaction. If you can help people, you should help. Many people set up resource sites for various things. It’s what they enjoy doing. hi ma’am, thank you so much for providing this valuable information. Its very helpful. When we can have your lessons in pdf format ? Over time I will put up the pdfs but I don’t have time at present to do them all. Yesterday I put up the pdf for the education vocabulary. Hi.Thank you Liz.it is so useful.I am new to your website. I think it would be better if you provide exercises in jpg formats so we cans print them and practice . Yes, I plan to put some lessons in pdf format to be downloaded but it will take time.